1. What is quinoa? It is a delicious grain that cooks quickly, very high in protein, a good source of fiber, gluten free, and easily digested. The seeds are usually available for sale in health food stores. Once it is cooked, you can recognize it by the small circles that become evident. 2. Why and when did I cook it? I was invited for dinner last week, offered to bring dessert. I’ve been attempting to get back to eating properly (for me) as much as possible. Since lasagna was the main dish (dairy, simple carbs, fat), I decided I wanted to make a dessert that had no refined sweetener; a healthier alternative to say - brownies. Since I had almost everything I needed to make a dish called Quinoa Pudding (Dr. Andrew Weil’s 8 Weeks to Optimum Health, chapter 2), that is what I made and brought. 3. The way you are directed to cook the quinoa always results in much more than is needed to make the finished pudding. In warmer weather I often use the leftovers to make a salad, much like tabouleh. Since it has been below freezing for many days now, this just didn’t fit the bill. 4. I decided to put the leftover quinoa into a soup using only items I had on hand. Below is the resultant recipe; I hope you will run with this and make it your own. 5. This dish is suitable for vegans as no animal products are included. Put the onions, oil, and garlic into a 3 quart saucepan and turn the heat on med. Allow all to sauté until the garlic is softened. At this point I added a little Tuscan Sunset (from Pensey’s Spices) and some red pepper flakes and continued to sauté for another minute or so. Add the reserved onion juice if you like it. Add the quinoa and enough vegetable stock to cover the contents of the pot and stir. Then add the carrots and peas, salt, and pepper, and other spices if you like. Bring to simmering and keep it going until the peas are cooked. One could easily use green beans or another vegetable in place of the peas, or add additional vegetables. Depending on how big the appetites are, this would serve 2-4 people. Have fun and please let me know if you try it yourself. I've never tried quinoa.I have texture issues, but I think I'm going to give it a shot-this looks too tasty to pass up. Is it similar in texture to tapioca, perhaps? Thanks for all of your comments, they are most appreciated. I won't say that quinoa is like anything else, per se. It comes out kind of light and fluffy and works well in many dishes. 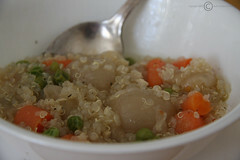 i love quinoa, it is my favorite grain ever...hands down..yum, yum, yum!! !